44mm rose gold case, Ulysse Nardin In House automatic movement with 42 hour power reserve, and glass back exhibition case. 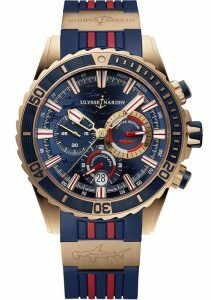 The blue dial is etched with images of Hammerhead sharks, with an image of a Hammerhead shark etched in the rose gold element. It is available on a sporty blue rubber strap with folding rose gold buckle.